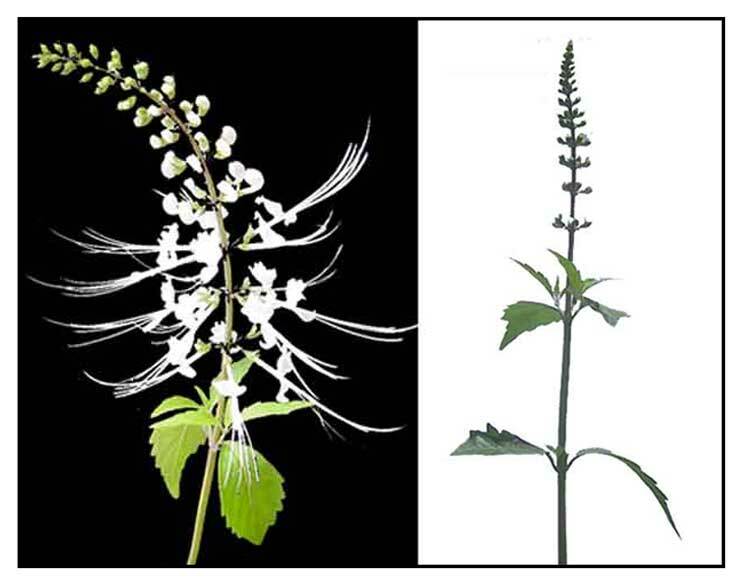 Cat's whisker is a common name shared by: (1) Orthosiphon aristatus, Kabling-gubat, Balbas-pusa, and (2) Gynandropsis gynandra, spider flower. FRENCH: Java thé, Moustaches de chat. INDONESIAN: Kutum, Mamam, Bunga laba-laba, Kumis ucing, Remuk jung, Songot koceng, Sesalaseyan. MALAYSIAN: MIsai kucing, Ruku hutan. Kabling-gubat is a slender, smooth or hairy undershrub, 30 to 60 centimeters high. Leaves in distant pairs, narrowed into the stalk, ovate, 5 to 10 centimeters long, pointed at both ends, coarsely toothed at the margins. Flowers are borne in very lax racemes. Calyx is bell-shaped, with a naked throat and two slender lower teeth. Corolla is 2.5 centimeters long, smooth, white or purplish, very slender in the tube, and thrice as long as the calyx. Nutlets are oblong and compressed. - In thickets, at low and medium altitudes in Cagayan, Isabela, Nueva Ecija, Pampanga, Bulacan, and Rizal Provinces in Luzon; and in Coron. - Also occurs in India through Malaya to tropical parts of Australia. - Leaves contain a high percentage of potassium salts (0.738 gm in 100 grams of fresh leaves. - From dried leaves, a small amount of volatile oil and a bitter alkaloid, orthosiphonin. - Studies yielded flavonoids, carbohydrates, tannins, saponins, phenols, and terpenoids. - Phytochemical screening yielded twenty compounds: nine lipophilic flavones, two flavonol glycosides, and nine caffeic acid derivatives. Caffeic acid derivatives included the major compounds rosmarinic acid and 2,3-dicaffeoyltartaric acid. - Considered anti-allergic, anti-inflammatory, anti-bacterial, diuretic and hypoglycemic. - Studies have showed diuretic, antioxidant, anti-tumor, hypouricemic, nephroprotective, anti-diabetic, antihypertensive, anti-inflammatory, antimicrobial, hepatoprotective, antifungal, properties. - Tea made from leaves and fresh or dried flowers. - Leaves are bitter with a characteristic odor. - Leaves reportedly rich in potassium (738 mg/ 100 g of fresh leaves). - Leaves used for gout and renal disorders. - Also used for its diuretic effect. - Poultice of leaves or chewed leaves stuffed onto painful tooth. - In South East Asia and Australia, frequently used for renal inflammation, kidney stones and dysuria. - In Holland and France, reported use for treatment of genitourinary diseases. - In Malaysia, traditionally used for bladder catarrh, diabetes, kidney diseases, for hypertension and as diuretic. - Java Tea is derived from Orthosiphon aristatus, touted for its diuretic action, kidney flushing benefits for kidney and bladder stones. - New age uses: Extracts used for skin whitening and as anti-cellulitic. Creams and lotions used to decrease skin oiliness. • No Diuretic Effect / Double-Blind Placebo-Controlled Study: In a study of four traditional Vietnamese herbal remedies (Z mays, I cylindrica, Plantago major, O stamineus) claiming to increase diuresis, no diuretic effect was seen in a placebo-controlled double-blind crossover model. • Drug Interactions / Lithium: (Moderate interaction) Lithium interacts with Java tea. Java tea might decrease the excretion of lithium and increase its blood level which may require an adjustment of its dose. (26) Patients should also be cautioned that the herb can augment the prescription diuretic effects. Tea, powders, extracts in the cybermarket. Chemical Specification of Orthosiphon aristatus (Blume) Miq. / Duangpen Pattamodilok et al / Medicinal Plant Research Institute, Department of Medical Sciences, Nonthaburi 11000, Thailand. Qualitative and Quantitative Analysis of the Phenolic Constituents from Orthosiphon aristatus. / Sumaryono W, Proksch P, Wray V, Witte L, Hartmann T. / Planta Med. 1991 Apr;57(2):176-80.